February is National Pet Dental Health month. While keeping your pet’s teeth healthy is important all year round, we always take time in the month of February to shine a light on dental health. Did you know that 80% of pets have dental disease by the age of 3?? The good news is that the early stages of dental disease are reversible with the right care. As veterinarians, we are also your pet’s dentist and we want to help you understand how dental disease is so much more important than just getting rid of your pet’s bad breath. In today’s blog we are going to address some of the most common questions we hear when talking about dental disease in dogs and cats. 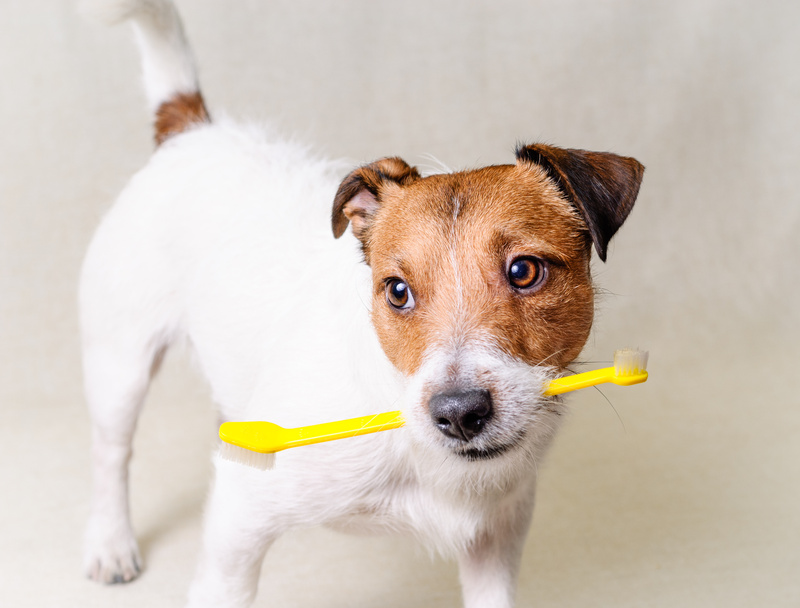 Does my pet REALLY need a dental cleaning? Do you feel the urge to turn away when your pet breathes on you? Have you noticed any loose or missing teeth? Is there a yellow, brown, or greenish substance coating your pet’s teeth? Do the gums look red and/or inflamed? Does your pet have a hard time chewing, or has your pet started dropping food? The buildup of tartar on the teeth causes bad breath, painful chewing, infections of the teeth and gums, and loss of teeth. Untreated infections in the mouth may spread bacteria throughout the bloodstream, silently damaging the heart, kidneys, and liver. With advances in modern medicine, our pets are living longer, happier, healthier lives, and we would like to ensure your pet stays as healthy as possible. How do you clean my pet’s teeth? Your pet’s teeth are cleaned the same way your teeth are cleaned at the dentist, except general anesthesia is needed for pets. Very few pets will hold their mouths open while we scale and polish their teeth! Since anesthesia is used, we strongly recommend running blood work on your pet before anesthesia. Blood work checks many of the internal organs to ensure they are working properly. Anesthetics are processed by the liver and kidneys, so these organs must be operating well in order for the patient to undergo anesthesia. An IV catheter is placed in a vein to allow us to give sedative medications and IV fluids during the procedure. Gas anesthesia is delivered through a tube placed in the trachea (windpipe) during the procedure. This tube also protects the airway and lungs from water and bacteria that are released while cleaning the teeth. The teeth are scaled with an ultrasonic scaler to remove tartar. Using an ultrasonic scaler allows us to do our job faster, so your pet doesn’t have to spend more time than is necessary under anesthesia. A thorough oral exam is conducted by the doctor. Teeth are inspected for gum erosion, pockets around the root, and chipped or broken teeth. Any diseased teeth past the point of saving are extracted. If a pocket on a tooth is not too deep, a gel-like substance may be inserted to seal the gum back onto the tooth. This gel also contains antibiotics to help the tooth heal. It can only be used in dogs. If a tooth is extracted, the remaining pocket can be left open, or may be closed with absorbable suture material depending on the level of disease. The teeth are polished to remove any rough areas. Tartar easily adheres to rough surfaces. The procedure is completed, and your pet is allowed to wake up from anesthesia. Pets are generally groggy after waking from anesthesia. We usually keep them in the clinic for a few hours to ensure they recover fully. Most pets are back to normal (and feeling better thanks to their clean teeth) by the next day. Depending on the severity of dental infection, we may send your pet home on antibiotics and/or pain medications. What happens if I don’t get my pet’s teeth cleaned? Bacteria around diseased teeth can enter the bloodstream through damaged gum tissue. These bacteria can affect internal organs such as the liver, kidneys, and heart. Pets with dental disease often have shortened life spans due to significant liver, kidney, and heart disease. Long-term, diseased teeth will become so damaged, that they either fall out on their own, or must be extracted. Meanwhile, they are very painful for your pet. Due to this pain, pets often can’t or won’t eat well (if at all), resulting in weight loss and decreased quality of life. Please contact us today if you any questions that we haven’t answered here or if you think your pet’s teeth need to be checked out.